Today was the first flight with my brother Joe. If you have followed my Flight Log you know that our first scheduled flight to Bristol CT., for the Mid Atlantice Little League playoffs was scrubbed due to wx. 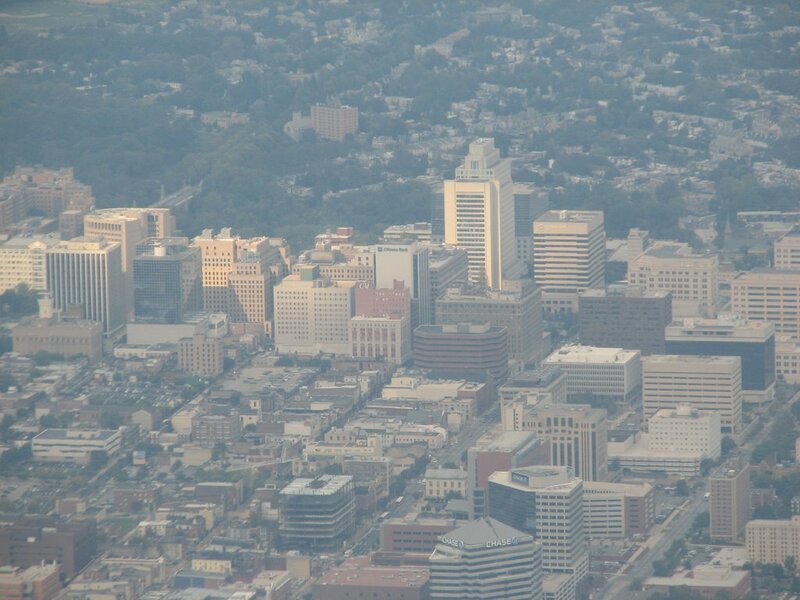 For this flight I had planned Ocean City, MD, thought about and planned Wilkes Barre, PA and finally decided for his first flight a view of the local area and a quick trip along the Delaware Bay would do the trick. Yes, back to KWWD Cape May. 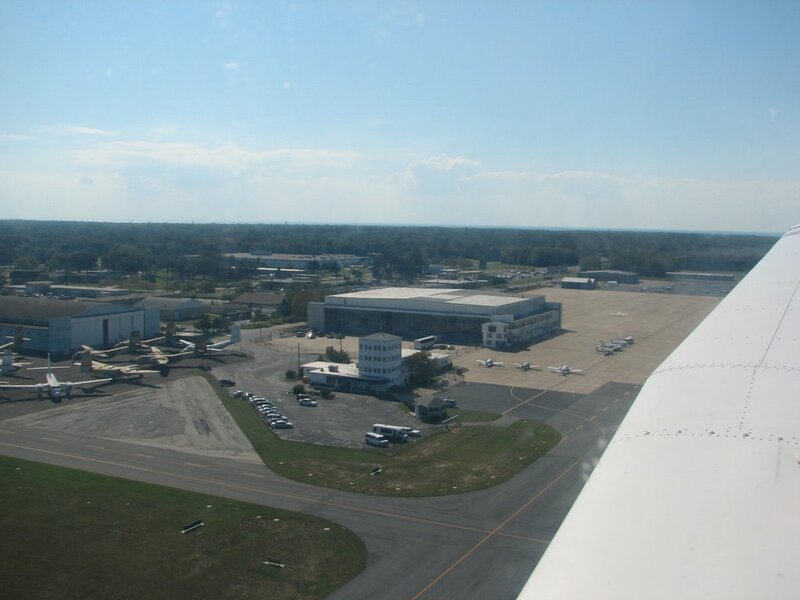 We departed N99 with some clouds in the sky and the WX Briefer noting SCT at 4500 and along the route 6000 but clearing for a great VFR day. SOLD! I liked what I heard and decided it was a go. 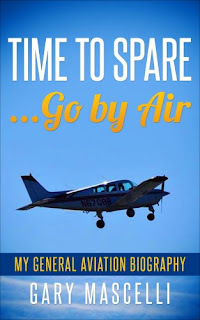 I explained some of the pre-flight followed by a briefing once buckled in. We had to wait on two aircraft landing then we departed on 27. I announced departing the area on crosswind to the south and switched frequency to PHL APP. I made two calls and never got a response, very strange since I did get confirmation that we were transmitting prior to our departure. Funny quote of the day..."Wow, there are a lot of pools down there"....I just laughed, every pax has made the same quote as we climb out of N99. I guess I need to sit right seat and check out that view. Well low and slow was the plan so I held steady at 2800 and passed over the class Delta at KILG making way for the Jersey coast along the Delaware Bay. 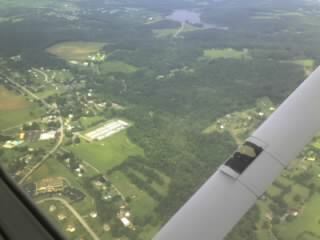 A bit of bumps but getting smoother as we passed by Bridgeton and had Millville Airport in sight (in the distance). As I pointed out landmarks and chatted about flying in general we had the extreme pleasure of sharing our airspace with a gorgeous Bald Eagle. Mr. Majestic soared along, never getting to close but looking our way and impressing us with his steep bank turns as he broke down and away towards our 8 o' clock. I dialed in the ASOS at KWWD and with winds 210* we made a straight in final for r/w 19. The place was quiet, so quiet I could not even get an airport advisory on unicom. Again a high approach with a squeaker of a landing and we were clear of 19. We made a stop at operations to visit with the Operations Asst. 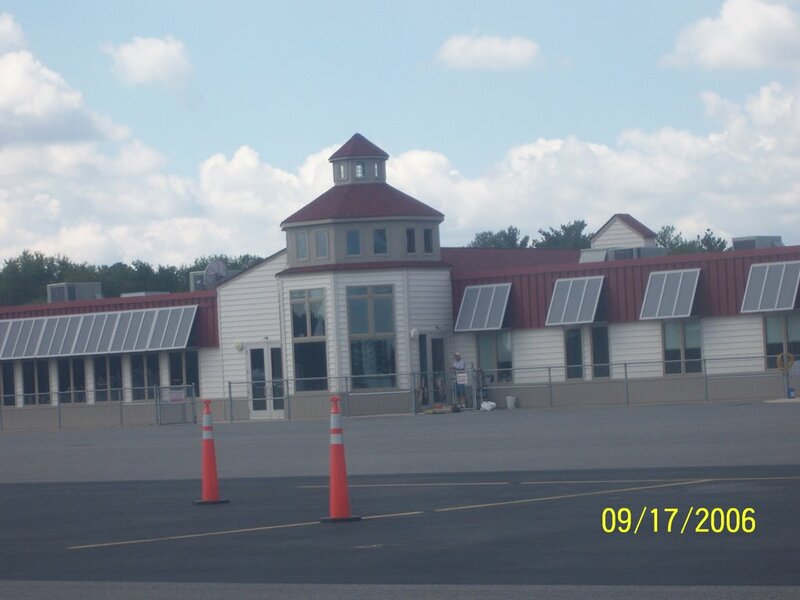 Manager for New Jersey Airports run by the DRBA and fellow co-worker Tom Berry. A quick "nature" break and a chance for my brother to catch a smoke. We enjoyed the sun as we hung out at the picnic tables near the airside of the terminal. Neither of us really wanted to visit the museum instead we rather get as much air time as possible. After a nice visit with the Tom, I did a walk around and oil check prior to climbing in 8LA. After a run through the checklists it was Clear prop followed by 8LA coming to life. I asked Joe to keep the door cracked open in order to keep us cool on the taxi out, assuring him we will "button up" for the run up and take off. Run up complete and waiting for a Piper followed by a 1940's Bellanca Cruise Master(file photo on left)to land, we were then ready to go. This baby was sweeeeet, white with red trim and looked new out of the box, what a restoration. 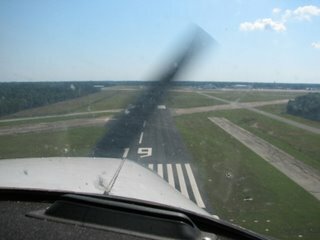 Cape may traffic, "Piper 988LA departing runway 19" and we were off. Nice smooth takeoff with a turn to crosswind and downwind giving us a great view of Cape May, Wildwood and Atlantic City in the distance. I announce departing the area to the North on the left downwind for 19. Tom from operations thanks us for the visit and I acknowledge with a thanks for having us in and see you during the week....at work. Tuning in the DQO VOR I make way for KILG with the plan picking up the MXE VOR as we cross the Delaware River. Nice and smooth on the way home with all the cloud layer having pushed out towards the north east. 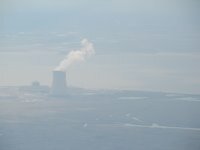 With the Cooling towers in view it was an easy day for navigation. The hand held GPS unit did not get a lock today, but no biggie as they say, I much rather look out the window and reference the big picture. I enjoy hunting landmarks, it's sort of like driving and knowing each corner building, gas station and local store. As we crossed the river we felt a little chop which messed up Joe's pictures of the Delaware Memorial Bridges. 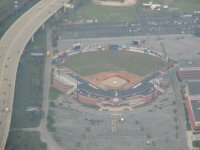 He did take some nice shots of Wilmington and the Blue Rocks Baseball team stadium. We easily picked out the Rollins building, and located the little league fields that we coach at. 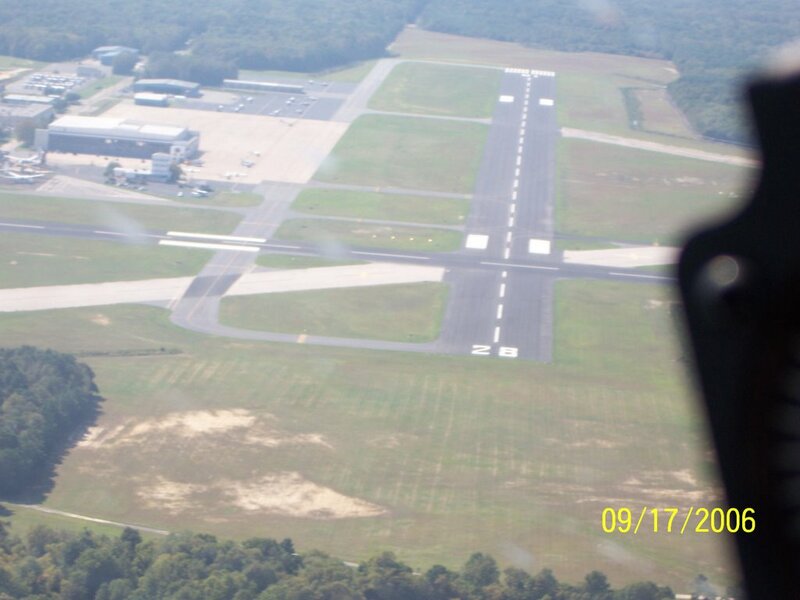 It was a fun flight as I turned for the 45* entry to runway 27 at N99. Ahhhhh...almost forgot, toady was the first time I got to dial in the AWOS at Brandywine, N99. Yep, that's right it's been certified by the FAA and is broadcasting on 121.4, very cool. 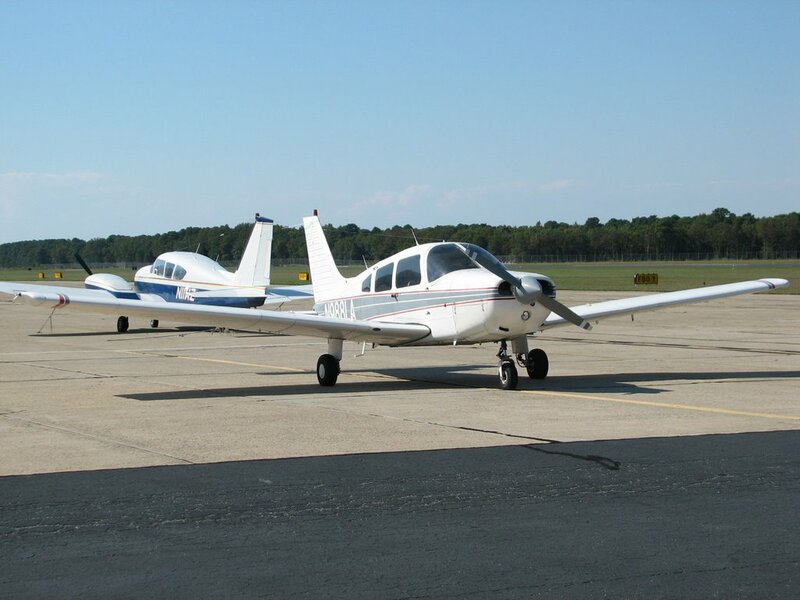 As of October 1st Mary and I will be flying the Delaware Flying Club plane at KILG. We were very lucky to find an opening in this club. DFC has only four members and the schedule is pretty much wide open for securing dates to fly. This will open up the chance to do overnight to some of our wish list locations!! Today I received my Private Pilot License in the mail. It's not the best looking plastic in the wallet, but it's my favorite!!! With a change in the work schedule I will have some time to fly Wednesday. I am going to flight plan for Ocean City, MD. KOXB will be a new airport for me and the farthest I've been south from the home airport. Yes, just a newbie and I am still learning how to stretch the wings. I guess I'm building up for that flight to Williamsburg in November. I will post the flight info, pictures and write up Wednesday evening. Well not quite the song, but indeed a nice trip to Georgetown then a hop across the Bay to Cape May. The aircraft we wanted to schedule was signed out until 11am so Mary and I got a later then planned start, which I thought was great, last time I was in one of these planes the weather played a huge part in me not enjoying the ride. So it worked out perfectly enjoying a light breakfast then heading out. After a preflight and hook up of the Lowrance 1000 we were ready to go. Today is the first trip we had to use the Lowrance. N988LA is GPS-less. I had fun taking advantage of every opportunity to use pilotage. First checkpoint was KILG and the Delaware Memorial Bridges. 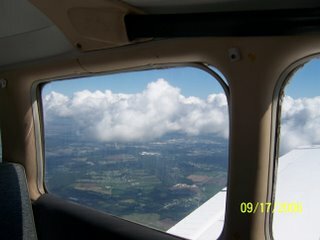 Cloud layer was at 3000-4000 so I transitioned through the KILG class Delta then climbed through an opening to 6500 on top. 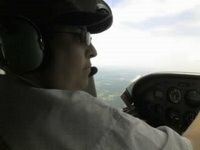 As a newly minted pilot, this was my first time "over the top". I made the decision to go over the top after looking down the Delaware bay a seeing the cloud layer extend along what I thought was beyond KDOV and with some tops at 4500 (my guess). The only opening was straight down the Bay but again I could not see an opening to make my way towards the west and Georgetown. I rode the "on top" 6500' south west to the west side of the KDOV airspace and found a great big hole and settled us through it down to 3000'. This has to be the most humbling yet breathtaking experience I have ever had to date in the plane with Gary. The pictures show the magnitude of the beauty that can only be appreciated by this view. I was thrilled that Gary and I had this opportunity together............ I wonder at times when I don't go up with him, what am I missing today? 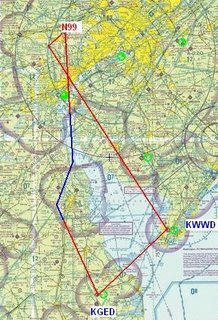 I was happy to ride along at that altitude until the 5 mile 45* entry to r/w 4 at KGED. I know 4 white and right of center but a nice landing......darn no video to help me out with this one. Good flight, had fun and of course the eats were good. I have learned very quickly not be surprised at the dinning opportunities that are awaiting us. We have enjoyed breakfast, lunch and dinner and I highly recommend the restaurant at the Georgetown Airport. Mary and I sat next to Bill and his wife, we met them at the LNS fly in (the one we did the "drive in") due to no checkride at that time. We chatted for a while swapped numbers (both brides love Bed and breakfast places) and were on our way to WWD. This is the part that everyone has been telling us about, making new friends and sharing in the adventure.A quick pass over Lewes looking for the tall ships, we found none but did get a good look at the Ferry crossing. 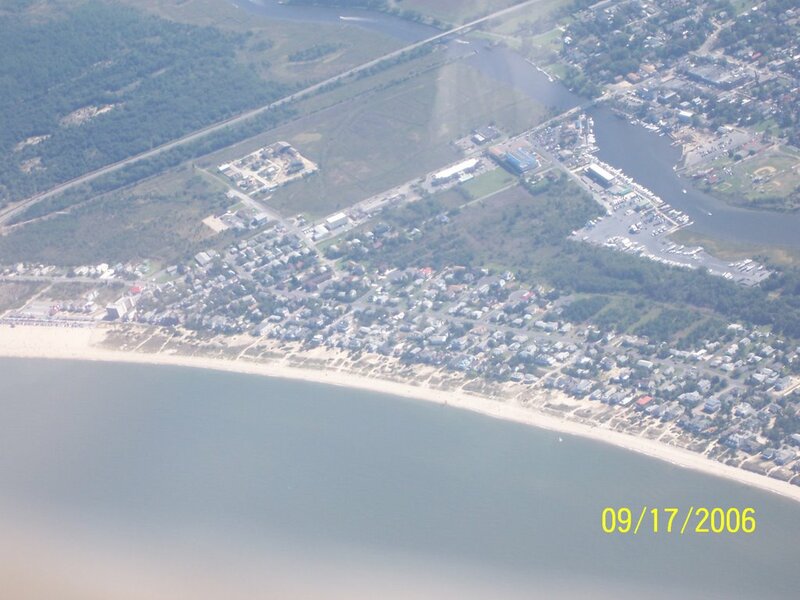 We then turned east and crossed the bay for a stop at Cape May. 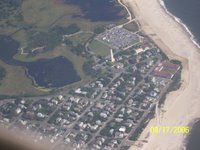 Mary has a nice shot of the Cape May Light House and she captured another short final and high but another good landing and that's my story, besides that zoom lense does not help ;). A quick departure from Cape May and we were headed home to N99, good trip and a nice ride home! Brandywine is now in sight. Calling out my 45* entry to downwind 27 at Brandywine I had a visual on a Cessna also entering. I turned out and re-entered on the 45* to be No. 2 to land. An aircraft was on cross wind as I had just turned downwind and he announced No. 3 behind the Piper (me). All is well as we three make our way home. On downwind I notice a CAP Cessna sitting at the hold short. No. 1 to land calls out his base and final, as we pass abeam each other I extend slightly and turn base also. 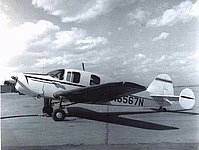 The Cessna at the hold short announces his departure on 27. Mary and I both can't believe what we are about to see. This guy HAD to see at least one aircraft on the base final portion of the pattern or he was clueless. The No. 1 to land was on very short final as the Cessna began taxi on to 27. Repeated calls by No. 1 to land, calling out short final fell on deaf ears. The guy on the ground started his take off roll and No. 1 to land announced a go around very calm and collected. I watched it all unfold adding in the last notch of flaps early to slow down and give plenty of room, enough so that I could land as the CAP Cessna was now well upwind. Ok, now this is the stuff that scares the *%%#* out of me..........what is the deal!! But the gentlemen did an excellent job of avoiding a potential accident, two thumbs up and he get's a that' a boy. I met the No.1 to land guy at the flight school, he was renting the same as us. I patted him on the shoulder and said nice job avoiding the nit wit. I told him the Bride and I heard everyone of his calls and just could not believe it. Except for the excitement at N99 it was a good day, we had fun, talked with some friends we had met at LNS and our 2.6 in the book leaves us needing only 4.2 in type to get into the club plane. Today is the anniversary of the World Trade Center attack. I hope everyone takes a few minutes of their time to remember those who lost their life, those who gave their life to help others and to our men and women preserving our freedoms we enjoy here everyday. Thanks from this appreciative AMERICAN! I completed my last hour of three dual in the Piper this morning, pounding out 8 landings between Chester County and Brandywine. 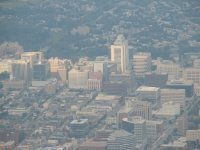 There was some ground fog that covered my landmark airport references, but over all good visibility at all times. I dialed in MXE and headed for home picking up the 54* outbound radial and calling out my 45* entry at 4 miles to downwind 27. I learned two valuable lessons today. CALL unicom for airport advisory. This will serve two fold, runway and winds along with a simple check that the radio is working. I like to listen as I approach and call in anywhere from 5 to 10 miles out. Well as I approached on a 45* for left downwind 29 at Chester county I had a radio problem. I think I had CTAF on comm 2 but no transmit so I checked my selection and it was comm 2 but still nothing. Now about to call the 4 mile 45* I decide to turn out and correct my problem and then re-enter. I was directed to continue in as the CFI brought comm 2 online. I made the call, even though I was turning downwind and continued on to multiple T&G's. Just returned from vacation so I will keep this short....I had noticed I didn't do a write up for last Thursday. 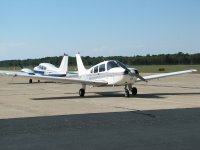 Yep, two hours of the three required to rent the school Piper PA28 are completed. I had a fun lesson today with a lot of slow flight, pushing the limit trying to get it to stall. Not easy, just some buffeting and mush for controls. Four landings in the book today, first one was flat, second was better but displayed my balloon talent :( I had to add a touch of power to make for a smooth return to earth after the balloon but ended up holding the nose off. Landings three and four were both simulated engine outs. First sim engine out was cutting it close that Piper glides like a brick, no, a concrete block. I made a no flap engine out and just got to the numbers, not a bad landing with all that was involved. Last but not least another simulated engine out at 1500' not quite to the approach of 27. I had traffic to the north east, no factor, one that just landed and he called clear, no factor and me. I turned in a bit quicker then the first go round and decided to listen to what my CFI stated, the Piper gets there faster but sinks quicker. Armed with this knowledge I get into a base/final turn then bang in flaps first notch then second, still a bit high but have it made so the last notch, get it to the runway and as I loose speed she settles in. Nice and smooth and an easy taxi to the last turn out. Time to secure 8LA and unload my stuff. As I button up inside the CFI pushes back and calls for left then right rudder. I roll out an on to the wing having to duck back in to "get the numbers". All secure and my CFI jokes that he must walk around to see if I had broken anything.......I asked was the last three that bad???? He cracks up and says no, not bad. I have a lesson scheduled Thursday morning to complete the 3 hours required. 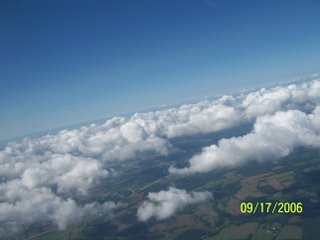 It has been three weeks since I was flying. 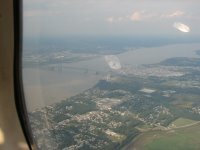 Last time in the Cessna 172 was our trip to Harrisburg (8/13) and last seat time in the Piper was the day before Harrisburg (8/12). Mary and I headed out to breakfast at our favorite local shop. We met a gentleman that is based at New Garden and really had a nice chat as we waited for our food. Mary and I agreed to hop over to New Garden and check the place out. With the morning eats taken care of it was time to call and schedule the C-172R for a few rounds of landings and some fun flying. Mary decided to pass on the landings so I invited my long time friend John who is really more like a second brother to me, our friendship goes back to 5th grade, whew.....That's a long time ago. Counting the years that would be about 37 or 38 ...Dang I am getting old! John and I headed out to the airport and completed the preflight around 11:40 or so and decided to scrub T&G's at KILG and instead fly over his sisters house south of 40N Chester county. It was a good fit, first time in a small plane in 30 plus years for John so staying local worked fine. Run up completed and taxi out to the hold short for a brief hold for helicopter traffic. Time to go as I announce departure followed by a last check for base, final and our taxi on to runway 27. Nice headwind today of only 4-8 knots maybe changing back and forth from 260* to 290*. John and I rotate at 55-60 and follow the noise abatement that is listed. I point out the mansion on the left and the houses on the right along with our track to be good neighbors. John noticed the same thing Mary did her first time up, "wow, there are a lot of pools down there"....I got a good laugh. John also commented how everything looked "like a model" sort of like an HO scale train set up with all the perfect buildings and roads. Announcing crosswind and departure to the southwest we scan for traffic and look to eventually make our way to follow Route 30 west bound. John and I each pointed out landmarks and it helped him with our position. We switched over to 122.7 CTAF at 40N and proceeded west about 6 miles north of the field. With 29 the runway of choice today at Chester County I wanted to stay well clear of the pattern. 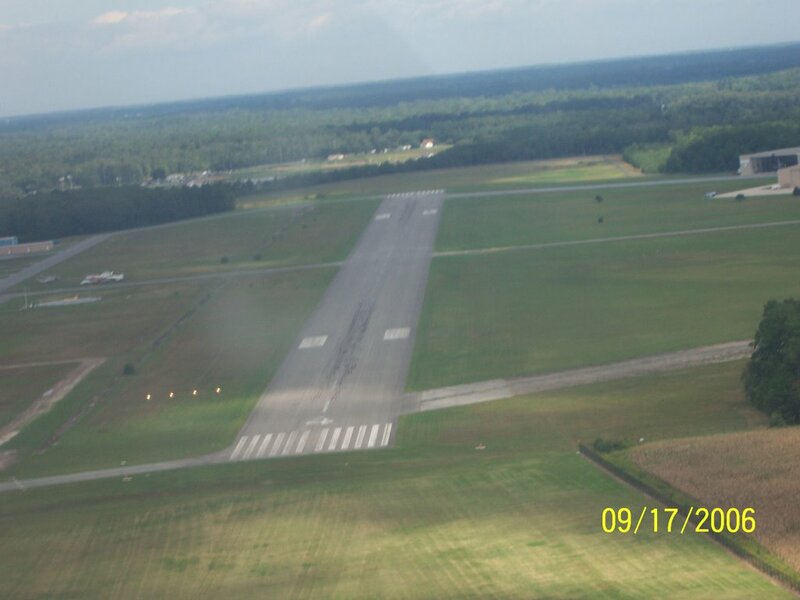 Once well clear of 40N we made a great big 180* turn to head back east and followed that with a 90* turn south to over fly Chester County at midfield. As soon as I announced over flying midfield at 2500 north to south, another aircraft called with the same info. The other aircraft did not gives miles out from midfield. John and I scanned with some gentle S turns as I immediately announced my position, track and not having the traffic. I also announced descending to 2200 knowing the TPA is 1660 and I would still remain clear of left downwind traffic for 29. Always have a plan, and I did. We cleared the field and the pattern as another aircraft entering the downwind for 29 called. I announced my position with altitude now climbing back to 2500 as I spotted the aircraft just entering from a 45* to turn downwind for 29. I acknowledged his position having visual contact as they passed under us at our 4 o' clock. Clear of 40N we looked for John's sisters house and sure enough he got a good laugh as I asked if they added a shed or garage in the SE corner of the property. He nodded and confirmed it was indeed the correct house. It was nice to locate her house and I'll have it for future reference when we can take a few more shots with a better camera and not the camera phone. I dialed in MXE and headed for home since I wanted to put a few landings in the book. My first landing was a tad flat, I needed to do better. Landings two and three were much better, stall horn moaning, nice flair and settled right down to greasers. Ahhhh....it felt good to be back in the air! I should have a few pic's added and maybe a landing video (my first). Tomorrow I am scheduled for 8LA the Piper. 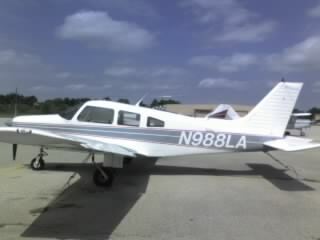 I need 2 more hours with a CFI so I can rent that on my own. If and when I hit 10 hours we can fly the club plane. The first dues check will go out for October 1st.